Minivans practically euthanize style as a matter of course, but it needn't be so. 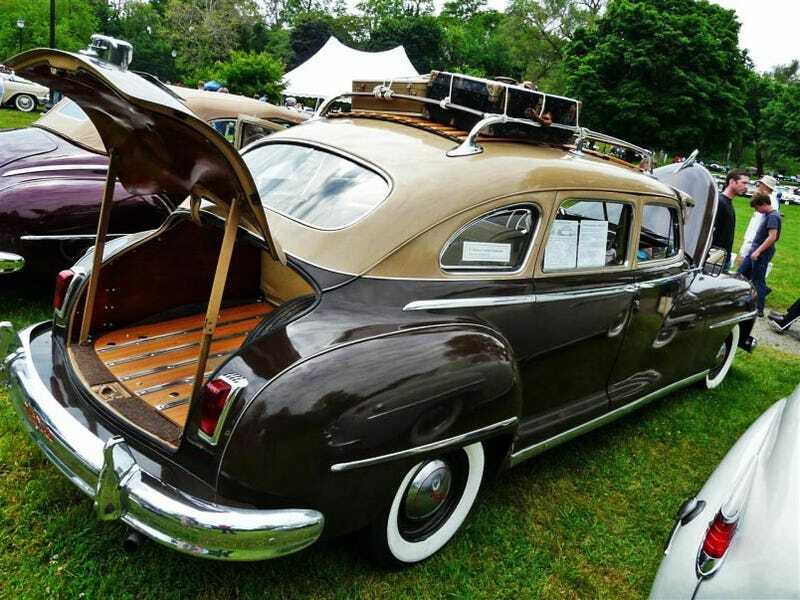 Check out this nine passenger 1947 DeSoto Custom Suburban, it's more stylish than a dozen modern Bentleys and cooler to boot. This gem was sitting riverside at the Orphan Car Show, and gathered a constant crowd. Even though DeSoto was already on the way downhill before World War 2, Chrysler whipped this vehicle up as soon as production resumed and though it didn't sell terribly well (the relatively high $2,093-2,631 asking price probably had something to do with that), you can't argue with its piles of style. It's got everything we love about post war-era cars, a flat-head straight six, acres of chrome, effortless passenger room and so much wood you wonder how the forests survived. Just look at that rear door, four different types alone. Then there's the rear load floor deck which would be taken up and modified in the Kaiser Traveler a few years later, super cool. Imagine driving this car and attempting to avoid a solid blinding from all that dash chrome, that's a problem we'd probably suffer through without complaint.